Update on 20 May 2015: The recent reports in Indian media suggest that T20 Champions League will be scrapped and won’t take place this year and will be abolished completely. That is due to lack of TV audience for the competition because there is no money to be made from the T20 Champions League. Last two competitions has been disappointing in terms of audience and revenue. Possible Alternative Tournament (Mini IPL) – BCCI are the major shareholder with 50% stake while Australia has 30% and South Africa 20% and since the biggest market is in India BCCI has the ultimate power to decide whether to go ahead with the competition or scrap it. There are rumours that a new Mini IPL will be introduced this year or possible next year instead of Champions League. Where top 4 teams from the Indian Premier League will play a short version of IPL event somewhere in September-October. But nothing has been finalized and we will keep you updated here with latest news about T20 Champions League. 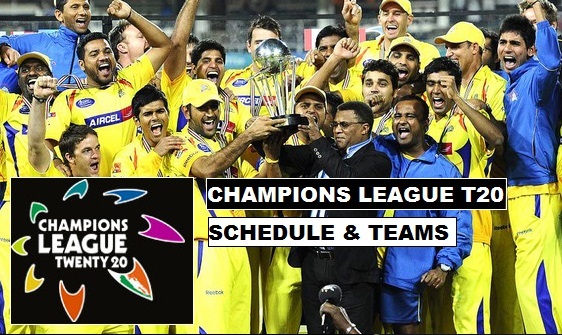 Yearly competition which is fast becoming popular in the cricketing world T20 Champions League 2015 will be taking place from the second week of September 2015. T20 teams from India, Australia, South Africa, New Zealand, Sri Lanka, West Indies and Pakistan will be contesting for the competition in the later part of 2015 cricketing season. The competition is most likely to take place again in India. Chennai Super Kings will be defending their title as the beat Kolkata Knight Riders in the 2014 edition of the competition. Qualifying round will be a round robin stage where 4 teams in 1 group will play against each other and top two will qualify for the champions league T20 group stages. CLT20 2015 group stage will have 10 teams divided into two groups of 5 teams each where every team in the group will play a match against other 4 teams and top two teams from each group will qualifying for the semifinals. Is champions league going to happen in 2015.
probably not, if we go with the recent reports coming out of indian media. when do u think it will possibally re-open?